Perhaps the most obvious occurrence was the one on Lewis Hamilton's Mercedes F1 W08. As he exited the chicane and powered up onto the start finish straight, the car vibrated intensely for around 5 seconds. The vibrations were thanks to an unusual deformation of both rear tyres, even though Hamilton wasn't particularly hard on the kerbs. A bit later on in qualifying, the deformation broke off a rear wing element on Lance Stroll's Williams as well. The issue cost him a second run in Q1. On Saturday evening, after Pirelli had asked teams to share data, so they could better analyse the issue, Williams' Paddy Lowe confirmed he didn't see such deformation before. "We have often seen before a kind of standing wave in the sidewall, but in this case, we're seeing a standing wave on the tread with sort of a flat threepenny bit shape to it," he said. "I've never seen that before. It's a very high amount of energy in that." 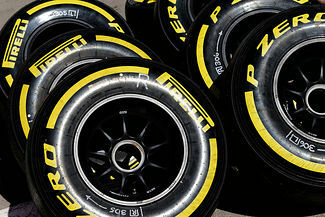 Pirelli reported on Sunday morning the issue was of no real concern to them, with lab simulations showing no immediate issue with the tyres themselves. Mario Isola, Pirelli's motorsport chief, said they were still trying to understand the matter. "It looks like we have this vibration just out of Turn 19 and Turn 1, so it is a specific point," he admitted, "it's not on all the circuit. But because it is the first time we see it so clearly, and maybe also the slow motion images were announcing a little bit this effect, when we see this, we want to understand it. "We are checking with all the teams, because it's important to have feedback from them. They have not only the data, they look at the suspension, they look at the floor, they look at the wings, so they can give us more complete feedback. Obviously if you touch certain frequencies, then you can generate a failure." Indeed, the rotational force exerted on the wheels, combined with high grip of the tyres creates flexing in the tyre walls. At a certain frequency - which depends partly on the tyre construction - flexural waves can form around the edge of the tyre. It appears that in this case at Spa, the energy in the waves was such that the tyre wall didn't normalise when completing a full rotation, resulting in the more than obvious shudder of the car itself. It'll be interesting to see if Pirelli can discover and reveal a complete explanation, and if such behaviour will be seen again at Monza, where cars similarly accelerate hard out of slow corners. Pirelli have bad publicity at every single race. That's what happens when you make tires from crap. I suspect that the instability is a result of a coupling between body lateral deflection (allowed by the lateral stiffness of the tyres) and body roll deflection (caused by the roll inertia force generated by the height of the c.g.). I noted the problem in the "2017 Tyres Revealed" topic and followed it up with a plausible explanation (I think).